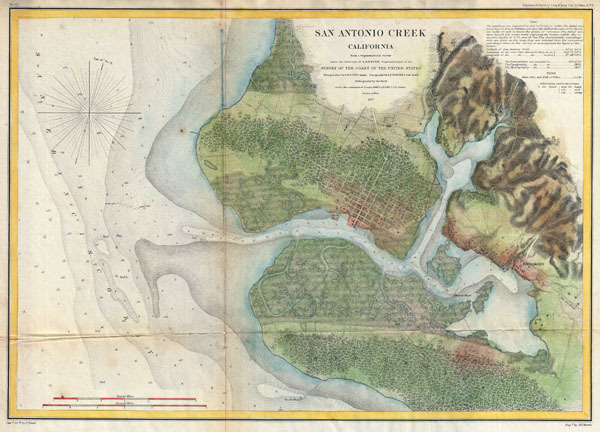 This is a rare 1857 U.S. Coast Survey chart of San Antonio Creek and Oakland, California. Oakland is an important Bay area city located directly east of San Francisco, just across the bay. Also shows Brooklyn, CA, and the road to San Jose, CA. Offers excellent inland detail, to the level of individual buildings, especially in the city of Oakland. Depth soundings throughout. The triangulation for this chart was accomplished by R. D. Cutts. The topography is the work A. F. Rodgers. The Hydrography was completed by a party under the command of James Alden. The entire work was produced in 1857 under the direction of A. D. Bache, superintendent of the United States Coast Survey. Very good condition. Original folds. Minor verso reapirs to margins.